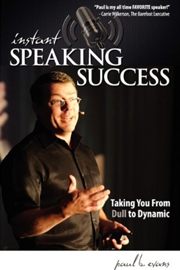 Successful public speaking consists of three elements: Content. A message packed with practical, easy to remember and useful information. Confidence. Knowing that what you share will be valuable and useful, and that you are the one to share it. Connection. You must be able to draw the audience into the message. That's what brings the laughter, the tears, the standing ovations. Not only will the combination of those three erase your fear, they will keep you from being dull and boring. In this book you will discover: A step by step process that takes you from the very first word of your message to the last syllable. This is not the open, body of the message, close outline that is taught so prevalently. This is a 7 step system that's impossible to mess up. The true meaning of communication and how it effects you. Just because something comes from a person's mouth doesn't mean communication takes place. The power of words. Do you remember the nursery rhyme, "Sticks and stones can break my bones, but words..." Never underestimate their influence again.